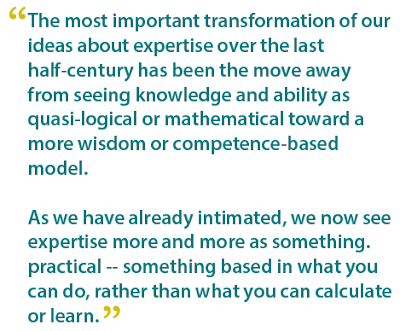 My sense is that our current of definitions and understanding of expertise may be at odds and stacked against helping novices to become experts. These are some ideas I have pondered on. I continue to plow the literature on expertise and find it most exhilarating and inspiring. In Outliers, author Malcolm Gladwell writes that it takes 10,000 hours to achieve mastery. His study reported cases on how mastery requires practice and dedication. Furthermore, Gladwell discovered that no “naturally gifted” performers emerged as experts. So there are no short cuts. I subscribe to Gladwell’s conclusions that mastery requires thousands of hours. However, this outlook is the far-end spectrum of what expertise is. If we look at expertise as an final end result of capability and mastery, then we may be stuck. Experts are rare and hard to find and expensive to recruit and retain in organizations. Erik Dietrich, a software architect has studied programmers and he observed the phenomenon of the “Beginner-Expert.” In How Developers Stop Learning: Rise of the Expert Beginner software developers are in high demand and the rapid phase of movement in organizations creates the new type of “Beginner-Expert.” These are perceived experts in very narrow skill areas who appear to have earned the reputation of being “experts.” However, they have only been a few years on the job and have not advanced in their proficiency levels, yet, have entrenched themselves in silos of expertise areas. 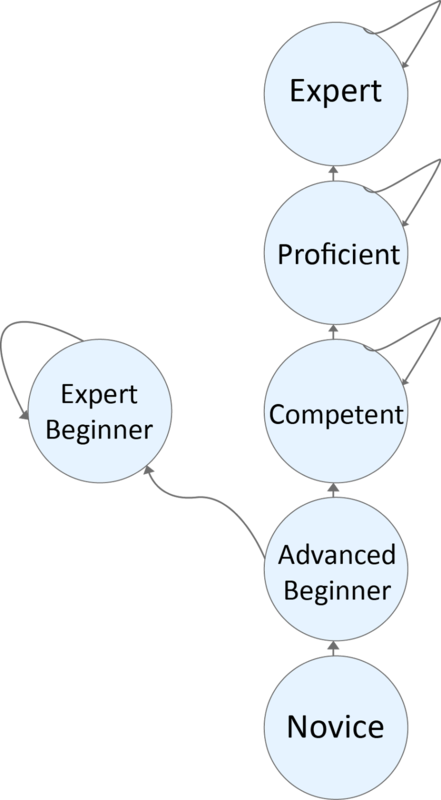 Dietrich believes this presents a problem because it leads to some form of incompetence, referred to in Dreyfus model of skill acquisition. I shall continue to digest Dietrich’s observations and reports. The Dreyfus model is a good foundational model. It is a static way to capture competency. When compared to today’s rapid phase of change and technologically abundant environments, the model could lead to a restrictive understanding about how we can leverage the knowledge of novices, advanced beginners and those who may not be experts, as defined by Dreyfus. My view is that there must be a way for organizations to further cultivate and maximize the knowledge of novices and experts alike. understanding, narrow meanings and access to the primary source of the knowledge. The model suggests that the value of expertise may occur at different levels depending on one’s current competencies. It allows a far broader consideration of the different values of knowledge and contributions. 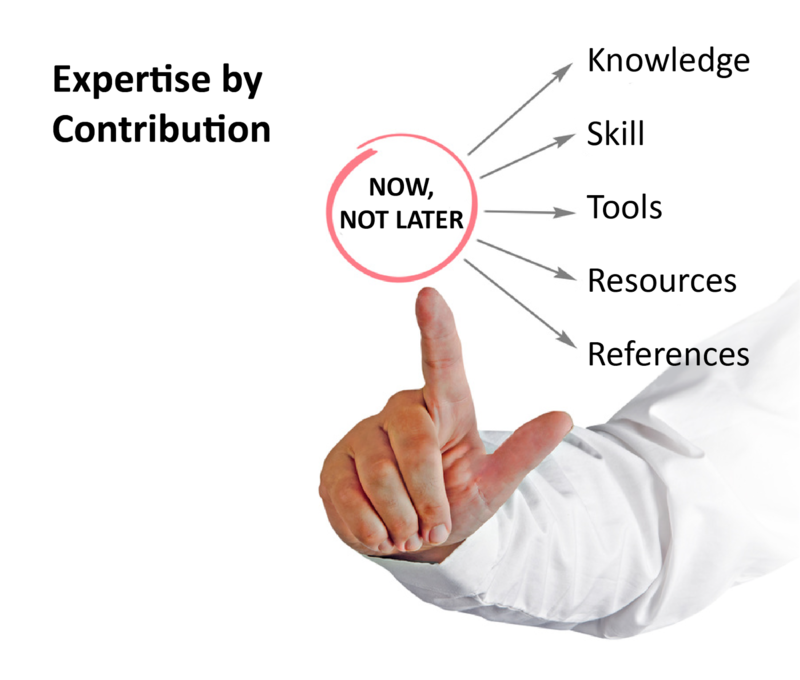 What drew my attention is the idea that different ways people developed expertise is a product of how much they contribute and interact with others and allow modifications and refinements of individual expertise. Critically, it requires that we must always know the limits and contradictions of our own expertise and the ability to clearly articulate these limits. I understand this to mean, that we all have some level of expertise knowledge. However, we have to constantly test it and subject it to other unknowns. In so doing, the value of our contributions are applied by others with the accompanying unknowns. A good illustration would be this. Many bloggers or reporters of knowledge oversimplify, underestimate and only represent one side of a viewpoint or a scientific finding. They fail to inform their audience about the limits and unknowns. See the PDF draft of the book. I propose that expertise is not a destination, but rather a momentary state of our value and ability to contribute. By keeping this thought, we may have an opportunity to train and assist learners and workers to look into their current competencies and knowledge while reflecting on how they may add further value. 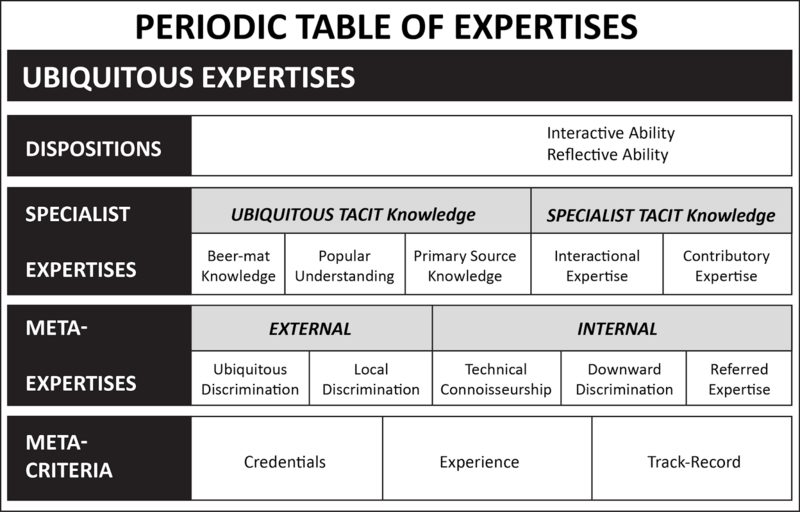 We can also call this the Contributor-Expert” or “Inverted Expertise Model.” What is paramount is that we as learners must constantly subject our knowledge to the unknowns and limitations so the recipients of such knowledge may be aware of both the value and the limitations. I will continue to study, reflect and report to you my progress. Until then, let me know what you think. A contributions approach has many advantages and will likely reinforce what efforts we invest in training and learning. These are a few of the ideas to consider. • Learners must subject their knowledge to limits and unknowns. Welcome! Sharing your comments is very valuable learning experience for me and others. Thanks!